There are nine legislative assembly constituency in Lucknow district for the 2017 Assembly elections. They are 169 Bakshi Kaa Talab, 175 Lucknow Cantt, 174 Lucknow Central, 173 Lucknow East, 172 Lucknow North, 171 Lucknow West, 168 Malihabad, 176 Mohanlalganj, 170 Sarojini Nagar. When Uttar Pradesh assembly election 2017 is getting ready to electios new Assembly, Lucknow is not anywhere behind in the election heat. 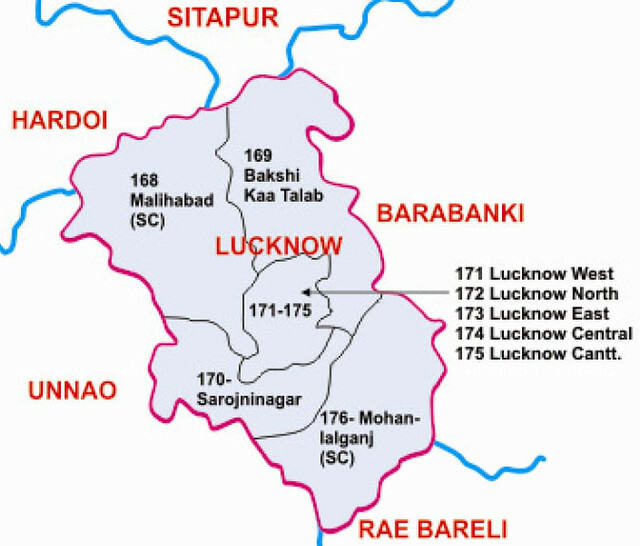 Lucknow District (Hindi: लखनऊ ज़िला, Urdu: لکھنؤ ضلع‎) is a district located in the Uttar Pradesh state in northern India. The city of Lucknow is the district headquarters and the district is part of Lucknow Division and also is the capital of Uttar Pradesh.The City was established in 1775 as the nawab of Awadh moved his capital from Faizabad to Lucknow and made it one of the most prosperous and glittering cities in all India.